Muzzle devices are not just for looks, they actually serve an important function. Whether you want to mitigate flash intensity or reduce felt recoil a quality muzzle device can help. I’ve rated & reviewed 18 of the best AR-15 muzzle devices available so you don’t make the mistake of choosing the wrong part. Some muzzle devices perform a specific task, like suppress flash intensity or reduce felt recoil. Other devices, called hybrids, can perform more than one function. For example, a hybrid device may reduce flash intensity and compensate for muzzle rise. Muzzle devices are found in any combination, and there are literally hundreds of options available. The one that’s right for you will depend heavily on your application and what you’re trying to accomplish with your weapon. Flash hiders are good at reducing flash intensity. If you shoot in low light conditions or need to conceal your visible signature, this is a great option. They also work well in home defense situations where excessive muzzle flash can temporarily blind you if it’s very dark and make it impossible to acquire a target. Muzzle brakes are designed to reduce felt recoil by directing gas in a manor that counters the natural rearward movement of the weapon when you fire a round. They make your AR-15 more controllable and less fatiguing – it’s a great option especially for competition shooters or smaller, weaker people. Linear compensators are primarily used on short barrel rifles and AR-15 pistols where gas pressure is very high as it exits the barrel. Essentially, a linear compensator directs this intense sound and flash in a forward direction away from the shooter. By combining multiple functions, hybrid muzzle devices offer more uses than a purpose built flash hider, muzzle brake, or compensator. They are found in any arrangement, and it’s important that you consider your application before making a decision. Below, I’ll discuss all of these devices in depth, as well as provide my top picks for each. Later, I’ll talk about major considerations, like materials and finishes, that you should be aware of when selecting a muzzle device. After reading this guide, I’m confident you’ll be able to determine what are the absolute best AR-15 muzzle devices for your application. 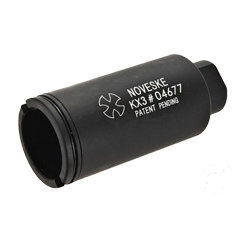 It’s commonly stated that the purpose of a flash hider is to conceal the shooter by making their visible signature smaller, thus harder to detect. And while this is true, the bigger benefit is their ability to preserve your night vision. When the round exits the muzzle, very hot, high pressure gas leaves too, often in the form of an large fire ball. The intensity of the light can temporarily blind you in low light conditions, making it impossible to acquire a target. This phenomenon is particularly dramatic in short barrel applications like pistols and carbines. Since there is less time to fully combust the powder and uncorking pressures are exceedingly high the flash can be extreme. Flash hiders work by rapidly cooling and dispersing the burning gases that exit the muzzle. Birdcage style flash hiders are most common, and are found on military weapons like the M16 and M4 carbine. These flash hiders have multiple prongs and a ring on the end to make it stronger and prevent it from getting entangled in vegetation. While these flash hiders work well, there are better designs that will reduce flash intensity far more. 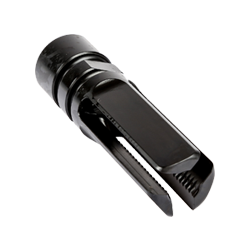 In particular three and four prong flash hiders are very efficient at cooling and dispersing the hot gas. The following five (5) options represent the best AR-15 flash hiders on the market. These reviews are backed by objective data collected from various sources. 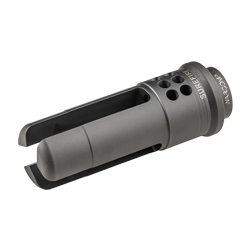 The Vortex flash hider from Smith Enterprise has long been a standard bearer in this group. It is simple, rugged, and aesthetically pleasing, but, more importantly, it’s extremely effective. They don’t get much better than this. The Smith Enterprise Vortex flash hider registers a 48% reduction in light when compared to a standard A2-style birdcage flash hider. It’s virtually imperceptible in low light shooting conditions. It is constructed from extremely durable carbon steel and features a phosphate coating. In general, fit and finish are very good with minimal little machining marks and a defect-free finish. 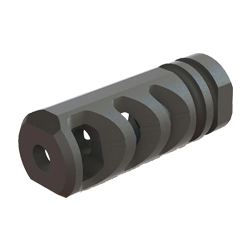 Smith Enterprise offers this flash hider in various sizes including .22 caliber and .30 caliber variants. At just 2.9 ounces, it adds very little weight to the front end. Price wise, this flash hider comes in at around $60, which is pretty middle-of-the-road. However, considering the performance and durability you get from this piece, it’s a great value and deserves a spot on the short list of great flash hiders. 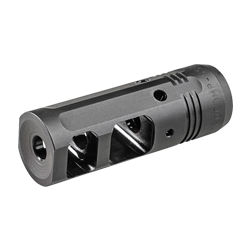 The JP Enterprise 3 prong flash hider is a standout performer. Flash intensity is reduced as well as, or better than, any other flash hider reviewed here. An integral shroud that overlaps the barrel makes pinning and welding a snap. 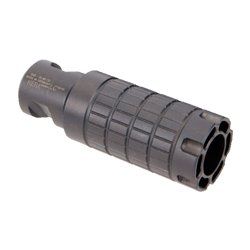 The JP Enterprise flash hider reduces flash intensity by 74% when compared with the standard A2-style flash hider. This is better than any other muzzle device I’ve tested. It is manufactured from tough carbon steel and features an excellent quench polish quench (QPQ) finish. QPQ finishes are very similar to melonite or nitride and it actually case hardens the substrate. This means improved wear resistance, corrosion resistance, and fatigue strength when compared to traditional phosphate finishes. 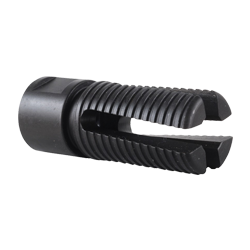 JP offers this flash hider in both .22 caliber and .30 caliber varieties and it weighs about 3.8 ounces, which is a little on the heavy side. It comes with a pre-drilled barrel shroud for easy pin and weld installation on 14.5” barrels to create a legal 16” configuration. At around $60 this thing is a steal. It’s unique features coupled with best-in-class performance mean this flash hider is hard to beat. The B.E. Meyers 249F lives up to the hype – its ability to reduce flash intensity is simply amazing. It weighs in at a paltry 2.5 ounces but is longer than most of the competition. 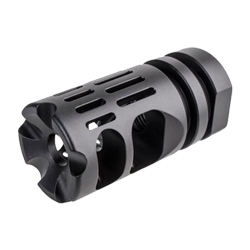 I would like to see a lower price point for this flash hider, at $95 it is a little on the high end. The B.E. 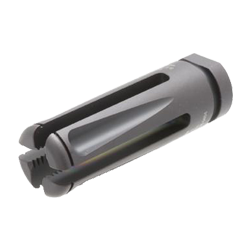 Meyers 249F flash hider reduces flash intensity by 73%, just 1% shy of the JP Enterprises part. That’s well within the margin of error, and, as far as I’m concerned, there really is no discernible difference in performance between the two. They both work great. 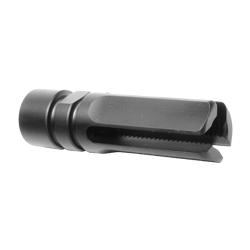 This flash hider is expertly constructed from carbon steel and has a durable nitride finish. The metal is free from any machine marks and the coating is defect free. 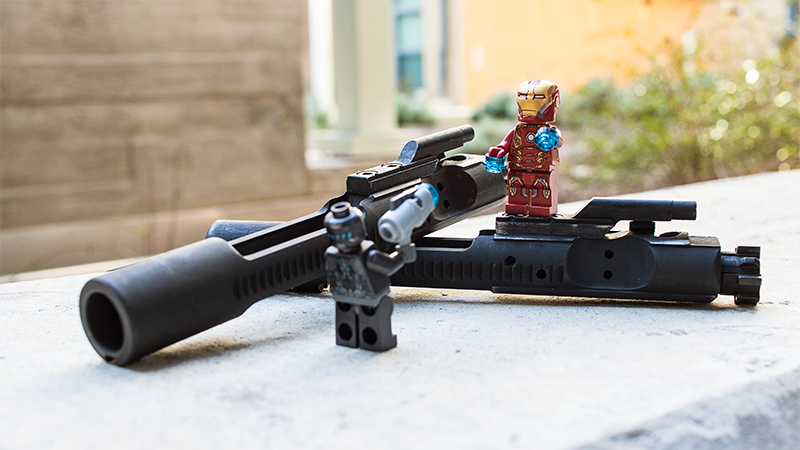 In hand, this flash hider feels substantial, the quality and attention to detail is obvious. B.E. 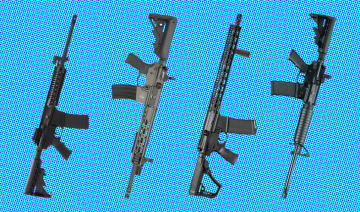 Meyers offers two variants for the AR-15 in .22 caliber and .30 caliber. If you really enjoy this flash hider, it’s available for other weapons as well. There are two minor faults I find with this flash hider. First, it is a bit longer than others in this category. Obviously, this doesn’t degrade performance just aesthetics, which is subjective in any case. The second fault is the $95 price tag. Though, this is a top-shelf part and quality demands a premium. 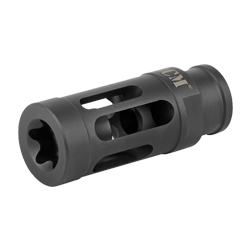 This flash hider is extremely versatile. Flash mitigation is topnotch and Advanced Armament offers a number of variations to match your aesthetic and performance needs. The one featured here lets you slip a suppressor on and off with ease. The Advanced Armament flash hider reduces intensity by 56% when compared to a standard A2-style flash hider. This is excellent performance from such a compact design. 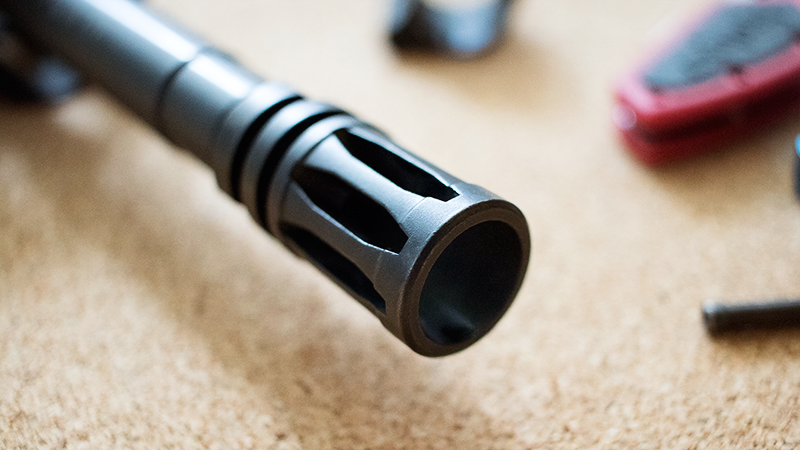 The flash hider reviewed here features a quick disconnect setup, which allows you to securely attach many Advanced Armament suppressors in seconds. Simply screw it on and the spring loaded mechanism will ratchet into place and lock on to the teeth on the flash hider. This setup is extremely stable and possibly one of the most rock solid mounting solutions on the market. However, if the proprietary Ratchet Mount system doesn’t interest you, non-mount flash hiders are available, too. 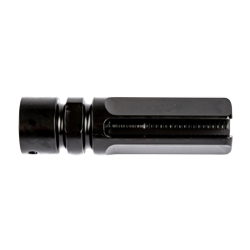 Each flash hider is carved from high-quality stainless steel and comes with a nitride finish. There are no complaints as far as build quality and aesthetics is concerned. This is an excellent candidate especially if you are looking to go suppressed in the future. The Venom flash hider from Strike Industries is, I dare say, aesthetically pleasing. But those good looks are backed by excellent performance and nice features like a pre-drilled hole for easy pinning and welding. 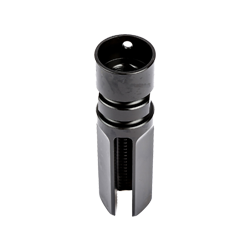 The Strike Industries Venom flash hider reduces intensity by 30% compared to the standard A2-style birdcage flash hider. This isn’t the best in class, but certainly very capable. It is, however, one of the better looking flash hiders on the market. It is also feature rich and offers a pre-drilled hole for easy pinning and welding. Though pretty compact, it is long enough to take your 14.5″ barrel to the required 16″ mark for rifles. 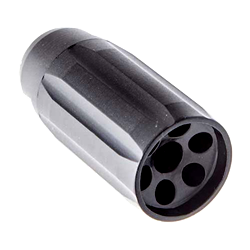 This flash hider is machined from durable carbon steel and has a phosphate finish. Machine marks are minimal and the finish was defect free. Overall, this is a great option especially if you’re looking for some extra range appeal. 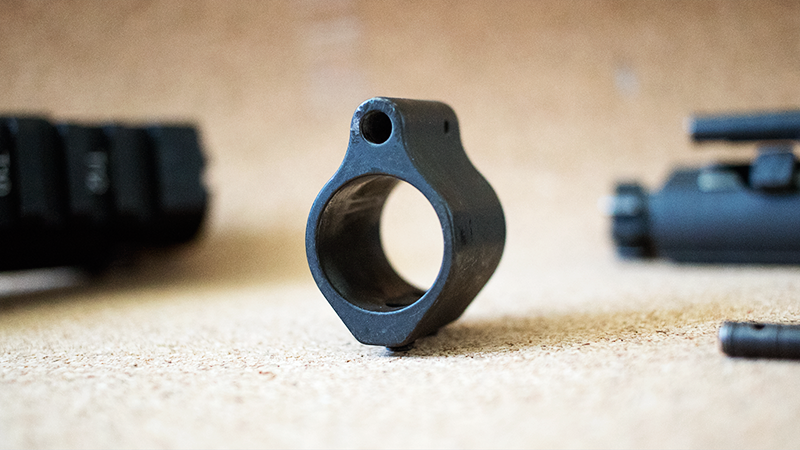 Muzzle brakes provide a significant reduction in felt recoil. If you haven’t fired an AR-15 equipped with a muzzle brake you will be amazed by the difference. It’s almost magic. 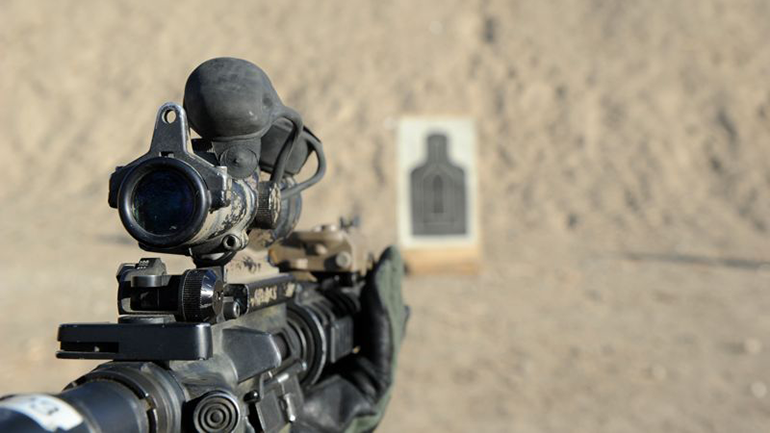 A good break will make target acquisition easier and will allow you to stay on target for rapid follow up shots. Some can tame muzzle rise considerably depending on the design. These devices work by rapidly diverting combustion gasses away from the muzzle so the kinetic energy does not add to recoil. Generally, these gases are ported equally to either side, but they can be diverted upward or biased toward one side to mitigate muzzle rise. Though, strictly speaking, it isn’t a muzzle brake, the A2-style birdcage flash hider is a common example of this phenomenon. It has a small shroud on the bottom that directs gas upward creating a reciprocal force downward to combat muzzle flip. Despite all the benefits muzzle brakes offer, they do have a few downsides. The shooter or close bystanders are often exposed to much higher sound pressure levels as well as increased muzzle blast and lead exposure. Instead of the blast being directed forward, it is now partially diverted to the side and even rearward towards the shooter. In addition, muzzle breaks offer very little flash suppression and may stir up dust and debris more readily than other muzzle devices. This puts the shooter at a tactical disadvantage as it increases your visual signature greatly. Though, overall, these are great muzzle devices and work well for competition applications, smaller shooters, or anyone who simply wants less recoil. The five (5) devices listed here represent some of the best AR-15 muzzle brakes on the market. The Precision Armament M4-72’s triple baffle design and upward biased venting controls recoil and muzzle flip exceptionally well. It’s rugged, reliable, and performs better than any other muzzle brake tested. The Precision Armament M4-72 is the standout performer with a 71% reduction in recoil when compared to the A2-style flash hider. It’s also extremely compact and very light weight unlike some others in this class. Precision Armament attributes much of this performance to their reverse venting triple baffle design, and they may be on to something. From my testing, muzzle brakes that port the combustion gasses slightly to the rear do perform a bit better than those that don’t. The difference, however, is only marginal. 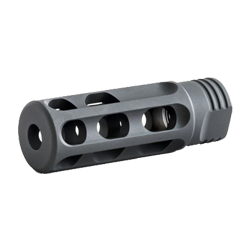 This muzzle brake is machined from high-quality stainless steel and features a very nice Ionbond® CrCN finish. Though it isn’t very common, the Ionbond® CrCN finish seems very durable and looks very similar to the more popular nitride finish. Precision Armament offers the M4-72 muzzle brake in both .22 caliber and .30 caliber variants and it weighs only 2.6 ounces. It’s amazing how well this piece performs given its compact design. As such, it gets my pick for best AR-15 muzzle brake, overall. The DPMS Miculek is a simple, durable, and effective muzzle brake. At around $40 retail, it’s also a great value. 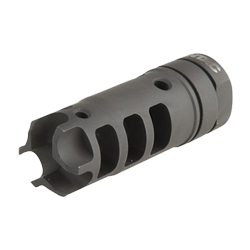 So, if you want an excellent muzzle brake without dropping a ton of cash, this one should be at the top of the list. The DPMS Miculek reduces recoil by 64% compared to a standard A2-style flash hider. At a price-point of $40, it offers possibly the best price-to-performance ratio around. 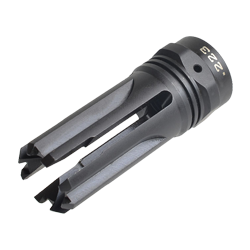 This muzzle brake is rather simple, and, beside the great performance and price, it doesn’t offer much else. Though, for some this is a positive. The DPMS Miculek is made from carbon steel and has a phosphate finish. 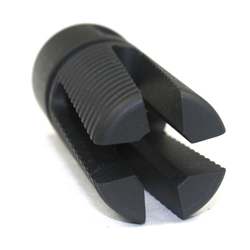 It also includes a lock-nut that insures your muzzle brake is properly timed and installed securely. There are versions available for both .22 caliber and .30 caliber rifles and it weighs just 3.3 ounces. All around, this is a great performer at a great price. If you’re looking for excellent recoil reduction without breaking the bank, this is a great option. 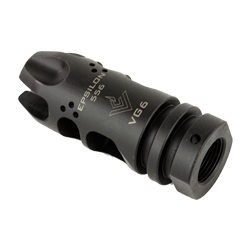 The VG6 Precision Gamma Muzzle Brake performs exceptionally well and looks good doing it. It’s also extremely compact at just 1.75″ long and weighs just 2.1 ounces. It reduces felt recoil dramatically and controls muzzle flip, which helps you stay on target for quicker, more accurate follow up shots. It even provides a little flash suppression. The VG6 Precision Gamma is more of a hybrid device, though it performs as well, or better, than any other dedicated muzzle brake featured here. In testing, it produced an exceptional 63% reduction in recoil over the standard A2-style flash hider. That’s just shy of the Precision Armament M4-72 and DPMS Miculek, but well within the 5% margin of error. It also mitigates muzzle rise very well. The bottom is shrouded and there are nine (9) small vents on top that direct combustion gases upward creating a reciprocal force downward. While shooting, everything feels balanced and follow up shots are easy since there is very little muzzle movement at all. Construction wise, the VG6 Precision Gamma is made from 17-4ph heat treated stainless steel and machine quality is impeccable. It comes with a nitride finish or raw stainless and is available in both .22 caliber and .30 caliber varieties. Needless to say, there are a lot of options to match your needs and aesthetic. The SureFire ProComp offers exceptional quality and performance. Recoil and muzzle rise are well controlled and it has provisions that let you fine tune the action based on personal preferences. Though, it works great right out of the box. In testing, the SureFire Procomp reduced recoil by 56% when compared to an A2-style flash hider. While not best-in-class, this is still excellent performance and you’re sure to notice a big difference. The ProComp is relatively simple in design with two large ports that vent gas to each side to reduce recoil impulse. It also features two smaller holes at the 12 and 3 o’clock position that vent gas upward and to the right. This helps counteract the natural tendency of the muzzle to move up and right when firing. Another hole can be tapped at the 9 o’clock position should you need additional adjustment, as well. 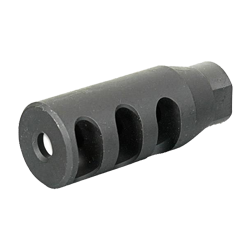 This muzzle brake is made from carbon steel and has a nitride finish for added protection. At 2.5 inches, the ProComp is on the long side but only weighs in at 3 ounces, so it’s not very noticeable and won’t shift the shift your weight balance forward by much. The SureFire ProComp is available in .22 caliber and .30 caliber varieties. If you’re looking for a muzzle device with similar performance and aesthetics but with the ability to attach a suppressor, be sure to check out the SureFire SOCOM. It performs identically and is even available in more sizes. The GoGun SuperComp XL is an excellent performer and is available in a lot different materials and finishes. Their titanium muzzle brake, in particular, is a very compelling low-weight option. But beware, GoGun muzzle devices are expensive. GoGun isn’t a super well-known company, but with excellent products like the SuperComp XL and Tactical Talon muzzle brakes, their stock is sure to rise. 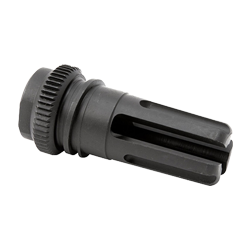 The SuperComp XL produces a 51% reduction in recoil when compared to the A2-style birdcage flash hider. While this isn’t class-leading performance, it still stands up very good to the competition. GoGun also lets you choose whatever material and finish you want. Material options include carbon steel, stainless steel, or titanium and finish options include phosphate, nitride, or just a raw bead blasted finish. The one downside to GoGun muzzle brakes is the cost. Their prices range from $85 for steel on up to $120 for the titanium option. Considering the great performance and relative availability of titanium parts, however, it might just be worth it to you. Short barreled rifles and pistols will generate a larger, more intense muzzle blast than long barreled variants. This is because there is less room for combustion gases to expand behind the projectile before it exits the barrel and less time to fully burn the gun powder. Linear compensators are designed to direct the intense blast forward and away from the shooter or bystanders. This reduces overall exposure to high sound pressure levels, heat, and lead. They are not designed to mitigate recoil, compensate for muzzle rise, or reduce flash intensity. As such, these are dedicated devices and are generally used on short barreled rifles (SBR) or AR-15 pistols for the sole purpose of directing the muzzle blast forward. Also keep in mind that linear compensators are big and heavy when compared to most other muzzle devices. The larger size can make it difficult to fit slim handguards and increased mass transfers weight forward, potentially making your weapon front heavy. Though linear compensators aren’t especially popular, I fell it’s prudent to include them in this article since they do have their niche. The three (3) devices listed here represent some of the best AR-15 linear compensators on the market. The Hera Arms GEN2 linear compensator is solid and effective. Its robust design ensures muzzle blast and sound are directed straight forward and away from the shooter. 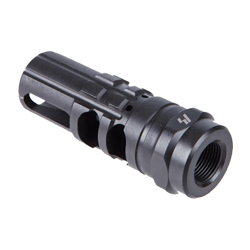 The Hera Arms GEN2 linear compensator offers exceptional fit, finish, and performance. The unique expansion chamber design effectively directs muzzle blast and sound directly forward and away from the shooter. Muzzle rise is also well controlled and the increased mass transfers weight forward, which makes short barreled rifles and pistols feel more balanced. This muzzle device is made from carbon steel and features a durable nitride finish. Machining marks are minimal and the finish is free from defects – it’s obvious that quality control standards are very high at Hera Arms. Installation is easy, simply remove your old device and replace it with the new one. The squared wrench landing is the same as a standard A2-style device, so no additional tools are needed to properly torque it down. Overall, this is an excellent linear compensator. Its great performance and aesthetics make it a perfect addition to any SBR or pistol. The Kaw Valley Precision linear compensator is simple, effective, and compact. Its small size and low weight mean this muzzle device equally at home on short and long barreled AR-15 variants. This is the category where, in general, you will see the most utility. While hybrid devices usually don’t perform as well as their dedicated counterparts, they can come very close. And, when you consider the added benefit of having two different devices in one they generally represent a better value overall. Like I mentioned previously, hybrid devices are found in any combination. Some are designed to reduce muzzle flash and compensate for muzzle rise, while others are designed to reduce recoil and muzzle rise. Still others can do all three. The same rules apply whether you’re choosing a hybrid device or a dedicated one. Always consider your application first and whether one type of device is appropriate for you or not. Muzzle brakes, for example, are not well suited for low-light shooting or for home defense. The elevated sound levels and flash intensity can damage your hearing and destroy your night vision leaving you vulnerable. On the other hand, muzzle brakes are ideal for competition shooters who require rapid and accurate shot placement. A hybrid compensator/flash hider device may be a better solution for home defense since it will reduce flash intensity and mitigate muzzle rise. The device you feel is right, however, will be up to you. The five (5) devices listed here represent a good cross section of hybrid muzzle devices for your AR-15. If you’re new to the AR-15 game, it’s unreasonable to assume you know everything about AR-15 muzzle devices and what makes one better than another. With that said, I’ve dedicated the rest of this guide to explaining some of the most important considerations. That way you’ll have a well rounded knowledge of the subject. The truth is, muzzle devices are simple and there isn’t a ton to consider. As long as it is machined from high-quality materials and it fits, you’re all set. There are a few minor considerations, like finishes, we’ll need to talk about, too. And, of course, the muzzle device should be functional – but that is more the focus of the previous sections. Let’s look at all of these things in a more detail and hopefully answer any questions you may have at this point. As always, if I miss anything feel free to let me know. Muzzle devices are constantly exposed to very hot, high-pressure gases. And, to withstand the beating, they need to be machined from high-quality, durable materials. It should be noted, though, that exotic or ultra tough materials are not a requirement in this case. Since muzzle devices don’t interact directly with the projectile and they aren’t a moving part, you may be better served spending the extra cash on an improved barrel or bolt carrier group. Carbon and stainless steel are the most common option and both work great. These alloys withstand heat well and are corrosion resistant – especially when combined with a quality finish. They’re also readily available and easy to machine, which translates into a better, cheaper product for you. Titanium is becoming a popular option, too – and even more so lately. 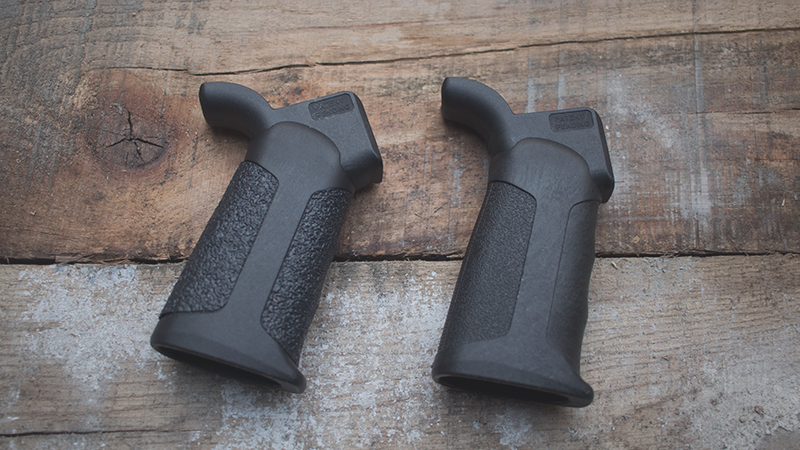 It’s combination of low weight and high strength make it an excellent material for many firearms applications. To give you a better understanding of each material, I’ve broken them out below in more detail. This will help you compare and contrast the benefits of each and give you a good starting point from which you can base a decision. Carbon steel is the most popular material used for making AR-15 muzzle devices. It’s durable, easy to machine, and cheap. That means you get a high-quality part that’s also budget friendly. This type of steel requires a good finish, like phosphate or nitride, due to its sensitivity to some chemicals and its propensity to rust. Without it, your muzzle device will quickly oxidize leading to premature failure. Stainless steel has many of the same benefits of carbon steel like high durability and relatively low price. Though, it is harder to machine than carbon steel, which leads to a marginally higher price overall. Where stainless steel shines is its high corrosion resistance. Stainless steel does not corrode, rust or stain as readily as carbon steel does. As such, it doesn’t require a finish, and, as long as muzzle device is properly maintained, raw stainless steel is perfectly viable for this application. A good finish is still recommended, however, as it adds to these benefits. With titanium you get an incredibly strong and lightweight part that’s naturally corrosion and chemical resistant. And, like stainless steel, a protective finish isn’t required. It’s an excellent material for not only muzzle devices but other firearm applications where light weight and strength are desirable. Though titanium’s strength-to-density ratio is unmatched, it does have a few downsides. It is hard to machine and generally more expensive than comparable carbon or stainless steel parts. Prices are poised to come down, however, as demand and availability increase. Finishes are meant to protect against heat, corrosion, and abrasion. For sensitive materials like carbon steel and aluminum they’re a must. Other materials, like stainless steel and titanium, are sufficiently robust that a finish isn’t necessary. In this case, a high-quality coating may still be beneficial, serving to improve corrosion and abrasion resistance even more. The most common finishes you’ll find are phosphate and nitride. These finishes offer excellent protection against heat and the elements, with nitride being the better option as far as these characteristics are concerned. To make things simple , I’ll outline each finish below and talk about their qualities, in depth, below. 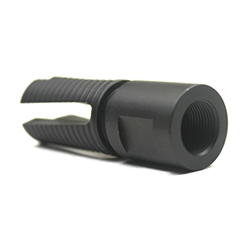 Phostphate is a popular finish not just for AR-15 muzzle devices but gas blocks and bolt carrier groups as well. It provides an excellent level of protection from corrosion and abrasions and adds lubricity, which reduces friction between moving parts. To apply this finish, the muzzle device is submerged into a heated phosphoric acid solution containing dissolved manganese phosphate salts. When the metal is placed into the solution, a simple reaction takes place, causing the dissolved salt to fall out of solution and precipitate on the surface. Overall, this is a thoroughly tested and proven finish, that offers enough protection for almost every user. However, if you’re looking for something a bit more resilient, nitride is a good option. Because of its hard wearing properties, nitride is becoming a go-to finish for a lot of manufacturers. It provides significantly better wear and corrosion protection than phosphate. It’s also a multipurpose finish or lining used on barrels, bolt carrier groups, and more. The nitriding process effectively case hardens the part by forming two layers on the metal substrate = a compound layer and a diffusion layer. The compound layer consists of iron, nitrogen, and oxygen, and is very abrasion resistance and stable at high temperatures. The diffusion layer contains nitrides and carbides. The surface hardness ranges from 800 to 1500 HV depending on the steel grade. 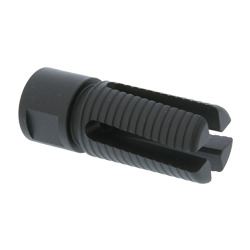 AR-15 muzzle devices are available in various sizes depending on the caliber of your weapon. It may seem like a no-brainer but verify what size you need before making a purchase. Since most AR-15 are chambered in .223 Remington or 5.56 NATO, .22 caliber muzzle devices are most prevalent. These devices will typically have a 1/2″ x 28 thread. Other popular rounds like 7.62 x 51 NATO, .308 Winchester, 300 AAC Blackout, and 7.62 x 39 require a .30 caliber muzzle device, typically with a 5/8″ x 24 thread pitch. Still others are available for up to .50 caliber rounds. This is not a list of every AR-15 muzzle device on the market. There are certainly quite a few other great muzzle devices that can be had. In fact, I’d be interested to hear your thoughts on the subject. If you have a recommendation, feel free to write your thoughts in the comments section below.